So, I’m not proud to admit it, but I was definitely feeling a little smug at having got such a cushty job for next year in my dream school (pretty much – i mean, my dream school would actually start at 10am, finish at 2pm and there’d be no more than 6 kids in a class…). …Then i realised that Bracknell town centre looks just like Coventry – but about half the size. And i’m really not exaggerating… OH DEAR LORD. But at least I have found a silver lining to being a teacher with no spare time. 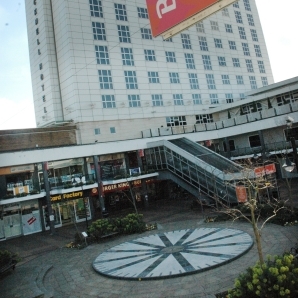 Bracknell is featured in the PlayStation 3 title “Resistance: Fall of Man” set in 1951, as the location at which power conduits travel deep underground South East England to power the Chimeran fortresses. It also featured in the sequel “Resistance:2” with a similar role. Tracy Beaker actress Dani Harmer was brought up in Bracknell.